Proper product life cycle management is key to running a successful company, especially looking at the long term. One time success is nice, but long term, repeated success is what really separates the sheep from the goats. 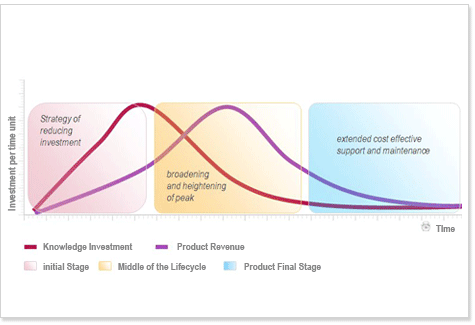 In order to plan and manage continuous success, proper product management is essential, and in product management, the product life cycle is a key element. Offshore software development in India opens new perspectives to actually implement these concepts, because you no longer have to work with the scare resources you have, but you can actually make us of softwaredevelopment capacity with no limits. Every Software Product has a Life Cycle. There is a beginning, and although we usually like to extend the life as much as possible, there is inevitably an end. Business wise there is nothing wrong with this as long as companies in due time (not too early, not too late) renew themselves with new products, or versions on products. 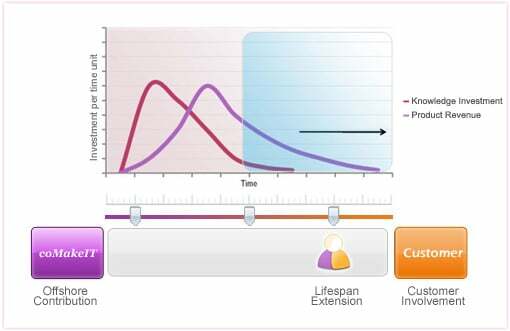 From operational perspective the Product Life Cycle is an important model. This is because different phases in the life cycle of a product require different types of attention, different types of teams and different types of development people. The models coMakeIT offers are therefore based on the phases within the product lifecycle model. In coMakeIT we have extensive experience with product software development, and product life cycle related aspects. 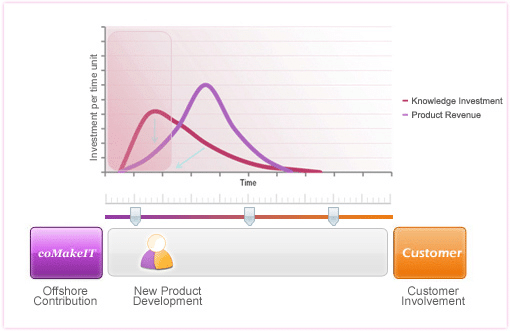 Product software companies have a product portfolio with life cycles for all their products. For each product the reality is that successful development is not a one-off, but a continuous effort, growing from one phase into another over time. It involves extensive buildup and retention of know-how, often referred to as IP (intellectual property). Because we realize this, we have adopted three baseline Offshore Development Centre Models, fitting into the needs of a company regardless of the phase its products are in. 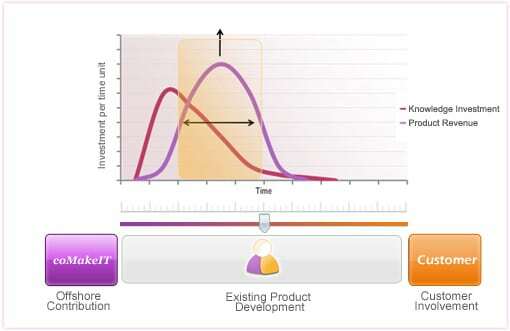 When new products need to be developed, there is still the possibility of lowering the overall investment in the product. Also there is no existing knowledge base which can be tapped into. This enables customers to choose for an all-offshore setup, which reduces the difficulties in communication, culture and knowledge sharing. The team setup for this model is tailored to the specific needs of start-ups and also of established firms who want to innovate with a completely new product. 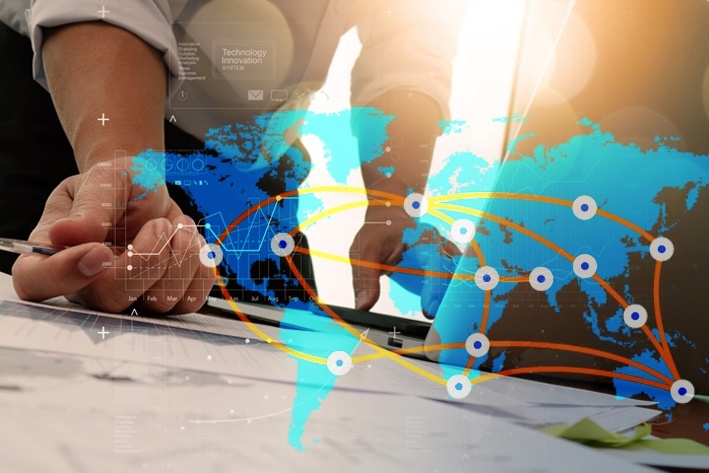 The strategy for new product development is to set up the offshore team in India in such a way that knowledge investments are reduced to a minimum. The focus of the development team in India can be entirely on realizing the goals set by the product manager onsite. 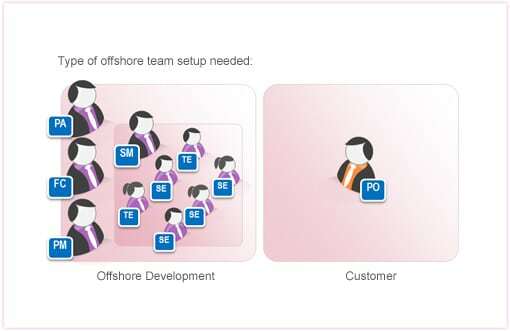 The offshore team needed is a full fledged team of developer, testers, technical writers and managers, that can be fueled by one single product owner on the customer side. The interesting thing is that you can build up a team the way you need it, with any technology skill. You do not need to be limited by the expertise available in your company, but you can use the abundance of highly skilled developers in the Indian market, truly making use of software development capacity with no limits. In contrast to new products, where the customer can still choose to start from scratch, in expanding product development there is a different challenge. There is a product, and there is already a significant investment in knowledge done. Now the product is becoming a success in the market, and demand is pressing R&D to speed up releases. The strategy is to increase and broaden the revenue peak of the product. 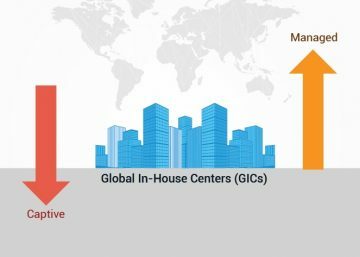 The demand is increasing, and so is the pressure on the R&D organization to deliver new functionality. 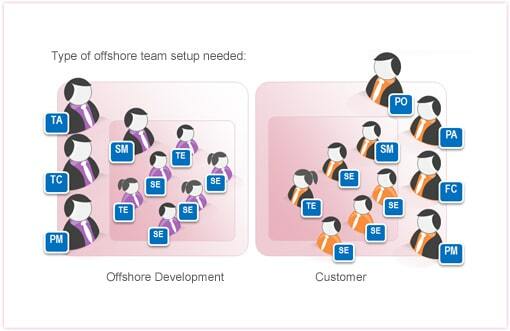 To increase the capacity of the organization, the offshore team needs to be able to tap into the existing knowledge. We have developed a team setup that is optimized for this challenge. The members of the team will be able to quickly absorb knowledge, and to communicate pro-actively. Also, we can bring in expertise that was lacking, and complete your R&D skillet. These teams will often work seamlessly with the existing R&D team of the customer. The strategy for expanding product development is to set up the offshore team in India and the onsite team in such a way that teams on both sides work towards increasing and broaden the peak in the time line of investments against product revenue. Teams on both sides will be similar, and off course it will take time to buildup the required knowledge. However, since the products at hand are in the peak of their lifespan, it is ofter not the question whether or not the investment can be recovered, but where to find enough people to actually capitalize on the success of the product at hand. In India, we can find these people, and even have you handselect them. Software development does not have to be limited by scarcity of resources! “Never sunset a product” is something many software companies dream about. This might be impossible, but it is a strategy with mature products to extend their lifespan. In order to do so, it is necessary to tap into existing knowledge and aged technology in a cost effective way. This requires another specialized team setup. The people inside these teams must be motivated by their rare expertise, and still be able to communicate efficiently with their counterparts on the customer site. The result needs to be that existing products with high revenue potential that would otherwise be in need of re-manufacturing can be kept in the market. This is also a way to keep long customer relations happy, without having to force them to migrate. Also, in niche markets, it enables companies to maintain products that would otherwise be replaced by expensive custom-built solutions. 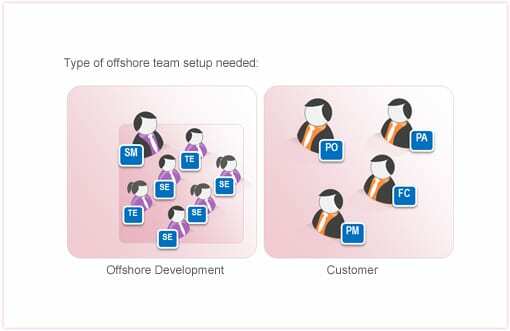 The strategy for mature development is to set up the offshore team in India and the onsite specialists in such a way that a minimal but highly skilled team is on the customer side and the team doing the coding, maintenance and buxfixing is on the offshore site, thus ensuring life span extension of the mature product is always in place. 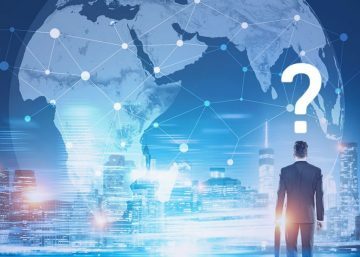 Surely for complex questions the offshore team has top be able to reach out to their onsite counterparts, but the majority of maintenance tasks can be executed offshore in India. Even for legacy skills, enough resources can be found in India, so you do not need to worry about finding then: we will make sure you are not limited by the scarcity of skills and resources. In our customer base we see examples of all of the above situations, and we can really see a significant differences in the types of skillsets, people and the way offshore software development teams in India are setup. If you are struggling with team setups and how to connect sourcing to your product strategy, feel free to get in touch! Our 15 years of experience in offshore software development in India can truly unleash software development capabilities with no limits.